This is our Airstream’s first time in Pennsylvania. Various interests have pulled us all over the continent except, until now, the North Atlantic regions. The Airstream Club invited us to attend a region rally in Centre Hall (it really is in the “centre” of Pennsylvania.) We stopped first for a few days in Penn Wood Airstream Park. Thanks to Rorie, the Park President, for allowing us in despite a very busy Memorial Day weekend in the Park. And thanks to the many folks we met this weekend for their friendliness. We’ve had a great stay in their home park and look forward to our next visit. The space Rorie found for us is at the top edge of Penn Wood (maybe she was hiding us?) It is a pretty and very quiet site. Our roof-mounted ham radio antenna works well here, better than many places we’ve visited. The nearby trees are fabulously tall white pines. I couldn’t resist hanging another antenna over the top of a great tree on this hill. Good antennas plus good atmospheric conditions provide opportunities for long range conversations on the ham radio. The last couple of nights I’ve talked to hams in Slovenia, Geneva, Aruba, San Diego, Mille Lacs Lake (MN) and Rentz (GA.) The wire antenna I was using, the site we were in, and great conditions all combined for easy and fun work on the radio. I’ve tried a lot of different portable antennas and wasn’t thrilled with many of them. I have a favorite antenna now. I learned a couple of years ago about a simple antenna from an article on the internet. The antenna consists of one 71′ piece of 12 gauge wire and an electronic box at the bottom. The box is an auto coupler, or auto tuner, and sits on the aluminum roof of our Airstream. The wire attaches to it, and a coaxial cable (similar to cablevision for your television) connects to the radio inside our Airstream. Sometimes the wire attracts attention, often it doesn’t. The wire’s insulation is grayish brown and the wire isn’t large. The rope pulling the wire steeply upward toward the tree is smaller than the wire. Combined they are over ninety feet long and go very high up to the tall white pine across the driveway. If you look carefully at this picture, you might see the wire sloping upward away from the trailer. I waited while he tuned up and answered when he called “CQ, CQ, anyone anywhere?” Gordie was visiting Mille Lacs Lake and trying out his very old radio with good luck. I don’t think the radio is quite as old as Gordie though — he’s 92 and says he’s been a ham for 75 years. I started too late to ever match that! We had an enjoyable conversation for almost a half hour. Doesn’t happen often but is nice when it does. Last week we were at the Airstream factory and at the Airstream Club central offices, both in Jackson Center OH. Enjoyed working with other members of the Club’s leadership on budget for next FY and plans for next year’s big summer rally. Membership is rising again, no doubt helped by the prodigious increases in production and sales from the Airstream factory and dealers. This year’s Airstream Club President Joe Perryman deserves a lot of credit too. He worked collaboratively two years ago with a team of very interested members to develop an action plan for the Club. Joe and his team have a lot of great ideas to improve the club. They arrived at a series of priority issues to accomplish during his leadership year. Under Joe’s watch the Club has implemented a digital directory (“Big Red Numbers Lookup”, some friends call it.) Joe relaxed the dress code for business meetings. He reinstated the electronic newsletter, “News and Views”; issued a survey of Club membership; hired a new Corporate Manager; has continued support for modernizing the Club’s administrative processes and has pushed for on line registration and renewals. It’s been a good year, and things are looking up for the Airstream Club! While at the Airstream factory we asked the service center to do an annual tune-up on our trailer brakes. It turned out to be a little more than expected. The excellent service techs found a problem with two of our wheels’ brakes and quickly adjusted their work plans for the afternoon to finish this up and get us going before closing time. Nothing is without a cost, though. I was hoping for a brake adjustment and repacking the trailer’s wheel bearings. Sometimes this work has cost us under $100. This time the techs showed us damaged drum faces and ruined brake magnets in our wheels apparently caused by a pair of lost retaining clips. They explained very well what must be done. Our bill was $1,000 to bring everything up to safe working order. It’s a relief to have the brakes and bearings in best condition and ready for another year on the road. An interesting thing about the Airstream factory service center technicians — they work ten years in the Airstream assembly plant before eligibility for joining the service center. Pretty good credentials, we think! We try to stop by every year or two and catch up on needed repairs. This afternoon found me begging to tackle anything productive. Our solar charge controller quit working ten days ago, displaying one bright red light and doing no work at all. We don’t have specific plans for boon docking in the near future. We’ve found over the past eight years the solar power system is very convenient to keep our batteries up no matter where we go. This charge controller’s only four years old and should be good for many more years but just stopped working. 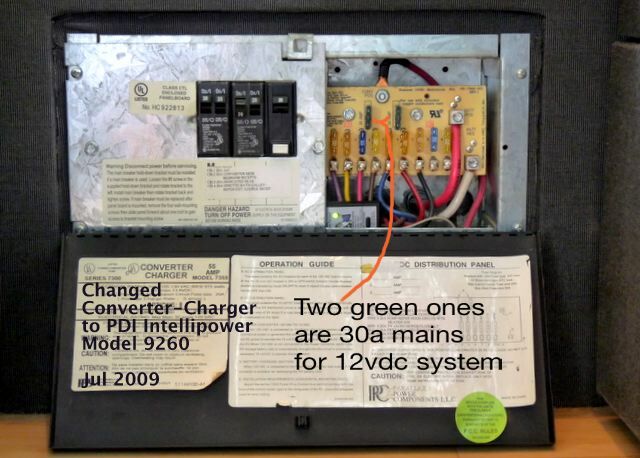 I had lined up a replacement unit identical to this one (BZ Products 2500HV) and decided to take a look before I ordered the new one. Pulled the fuse from the solar panels, carefully removed all the mounting screws to release the control box from it’s mounting spot. I took the unit out into bright sunlight and Debbie and I examined it very closely for any cold solder joints or blown components on the circuit board. The circuit board was dirty but everything looked fine to our unpracticed eyes. I carefully dusted off the board and realized I might have gotten by with just resetting power to the board to clear the failure. It hadn’t occurred to me earlier because I expected to find a blown capacitor on the board or a loose connection. Crossing my fingers as much as I could while wielding a screwdriver, I reassembled the control box and reinstalled it with all the electrical connections. When I reconnected the fuse the charge controller worked again. Four more years trouble-free service? I hope so. Having the solar collectors and charging is very handy and has allowed us lengthy stays in Quartzite, NC mountains, and elsewhere without any commercial power connections. Even when we’re connected to shore power, the solar charging system reduces our demand on the grid. Nice to have. This reminds me of another problem we corrected a few days ago. We’re connected to an old park power system and apparently are on the long end of it. Voltage is low and power is almost non-existent. We can’t run the microwave without going below 108vac. The low power tends to make me hyper aware of potential problems. I was probing around, just looking for another problem when I realized our batteries weren’t doing anything. We’re connected to shore power, the park’s 110vac system. We generally assume the batteries are ready to go too. I turned off the trailer’s main 110vac breaker, and everything turned off. Not s’posed to happen! Hmm, did low voltage mess up our charger? Are our batteries shot? Calmly, I pulled the trailer’s 12vdc two main fuses, one at a time, and put them back in (you can see the pair of 30a main fuses in the below picture.) The second one was apparently a little corroded, because when I plugged it back in everything powered up. A little strange. . . I’ll be tightening up all the 12vdc and 120vac terminals on our power system today! We feel very fortunate to have everything working well so much of the time. Bouncing down the road more than 100,000 miles in ten years is what the Airstream trailer is made for, but it can’t be easy. That’s a lot of shaking and braking, and fortunately not so much breaking. We often do routine maintenance and cleaning and try to keep a sharp eye and ear out for trouble. A well-built RV helps reduce problems. A little luck helps too. We are tickled we could attend Alumapalooza 2013 at Airstream’s trailer factory campus. Last year we missed by a few days attending and immediately marked our calendar for this year’s festivities. Lucky for Jim, the world’s largest ham radio convention occurred a couple of weeks before so he didn’t miss it, either. And we had time in between to visit with good friends in Dayton OH. Our first Airstream trailer, in 2004, led us to many enjoyable weekends RVing throughout VA, NC, SC, and GA. We didn’t go much further afield in our first two years because we were working very full-time. Membership in the airstream owners club introduced us to our favorite thing in RVing, making friends and spending time with great people. Our number one priority for nearly every rally we attend is PEOPLE! We enjoy renewing friendships and making new friends. We arrived at the Airstream Factory campus a few days before the Alumapalooza event. Our almost nine-year old trailer receives a lot of loving maintenance from Jim but there are a few jobs he doesn’t mind passing on. These we save for our occasional visits to Airstream Factory service in Jackson Center. As good as the service is, the visit to the factory is great icing on the cake for us. Every time we visit the factory campus we meet and spend time with fun and very interesting people. This year, because of the impending Alumapalooza rally, the camping area was chockablock full of fun folks. We enjoyed talking in the customer service waiting and camping areas, meeting people from NY City, San Diego, and many places in between. A favorite Airstream rallies meet-up for us is with friends Matt and Beth. We enjoy their company and have had great expeditions with them. This time we rode down to Big Shaggy Buffalo Ranch somewhere near Sidney OH and then to The Spot in Sidney. If we didn’t want the best pie or bison burger in all of Ohio, Sidney would still be a neat visit. It still boasts a downtown square, solidly anchored by the Shelby County Courthouse, surrounded by neat old buildings. One of many is the very notable Peoples Savings and Loan designed by Louis Sullivan in 1917. Click on that link to see Mary Ann Sullivan’s great photo work of this important example of early modern American architecture. We did eat in The Spot. The food is tasty and we’ll go back. Our real reason for this visit, though, was to attend Alumapalooza 4. Are we ever glad we did! Great seminars, fun chidren’s programs, no flag ceremony (gasp! ), inventive approach to arranging afternoon socials locations, and the best run rally announcements and door prize sessions we’ve seen in almost nine years. R&B Events (Rich and Brett and many good-hearted crew) planned and orchestrated a week filled with fun events for attendees of all ages. Our airstream owners club could take a few lessons from this great rally. It seemed the assigned representatives of the international airstream club might have remained rooted in the vendor tent instead of attending the great seminars. Fortunately Joe and Sandy Perryman (WBCCI officers) were browsing the activities and seminars and taking notes — good for you two! Jim joked with the current president of the international airstream owners club recently about R&B Events success in operating rallies. Jim asked John Boutwell if perhaps R&B Events should take over the annual airstream club rally, an event which is shrinking rapidly and appears nearly ready for withdrawal of life support. If the choice becomes shutting down the annual international rally or giving it away then MAYBE our airstream club’s leaders might condescend to allow professional management. Some of you know R&B Events recently took over the former Florida State Rally — the airstream club gave it up for dead and R&B said, “May we?” Jim postulated that R&B Events could operate in the black, unlike the airstream owners club international rally. Too, the rally would be a real kick. R&B Events know how to excite things, and aren’t bound so tightly to toilsome traditions. We’ve followed Airstream Life magazine and Man in the Maze blog for years. We met Rich (the R of R&B) in Perry GA in 2007, when we were embarking on our full-timing and he was full-timing in his Airstream bunkhouse trailer. We enjoyed swapping tales then and occasionally since. Brett usually was moving too fast for us to catch up with him at airstream club events, but we had admired his charm as an emcee and from watching him work with people. They’re great people we enjoy seeing and talking with. Would we recommend an R&B Events rally? Absolutely, before we had ever attended one. Their track record is fantastic. We already committed for next year’s Florida rally named Alumaflamingo, the replacement for Florida State Rally. We’re sure it will beat the pants off any Florida State Rally we’ve attended, and we have attended several over the past six years. Why would we have more faith in R&B Events than in the prior organization? Simply stated, these guys are fresh, dynamic, insightful, energized, and keen to try interesting and different concepts to attract appreciative attendees. Oh, and they know how to run introductions, announcements, and door prizes meetings – crisply and without demonstrating too much attention to themselves or to their admittedly recent traditions. We look forward to our next R&B event. Thanks Rich and Brett, for showing how much fun a large rally can be!